The summer of 1945 was not one's typical summer at West Point. Victory in Europe had already been achieved and the war in the Pacific was to come to an unexpectedly early end in August. The wartime Class of 1948 that trudged up the hill from the railroad station on in July became the peacetime Class of 1949 before the summer was over. Resignations occurred in such massive numbers that two additional companies of new cadets were admitted throughout July and into early August. One of those late arrivals was an 18 year old fresh out of an eastern Ohio high school. His name was Jim Rawers. With the chaos of Beast Barracks in that unusual summer of 1945 reigning all about him, and in spite of his relative youth and lack of any prior military service, Jim advanced through the summer ordeal with such unflappable ease that it seemed as if there had been nothing to it. It was just one more physical and psychological challenge to conquer as far as he was concerned. Born and raised in Bergholz, Ohio, the son of Dr. and Mrs. C. B. Rawers, Jim was a true native son of the Midwest, endowed with so many of the character- istics one associates with that region: physical strength, love of the outdoors, strong moral values, unwavering love of family and country, grass- roots common sense, and a healthy measure of personal reserve. Jim had starred in athletics at Canton McKinley High School, one of the nation's hotbeds of football supremacy. But since Jim never talked about himself, even his closest friends at the Academy didn't know the details of his earlier achievements. Perhaps that didn't matter very much, because Jim proceeded to make such an indelible mark on the athletic history of the Corps. He starred in football as an end, in basketball as a center, and in track as a javelin thrower. 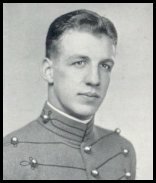 All in all he won eleven Major A's and captained the Army basketball team during both his junior and senior seasons. As great an athlete as he was, Jim was no slouch in academics either, graduating well up in the top half of the class and qualifying for later entry into graduate school in nuclear engineering. Upon graduation Jim chose the Air Force and proceeded to Waco, Texas for basic pilot training. But the bachelor life was not for him and during the Christ- mas break he traveled back to Bronxville, New York to marry his cadet sweet- heart, Jane K. Bast. After earning his pilot's wings, Jim was assigned to Wheelus Field in Trip- oli, Libya, where he served as pilot, instructor pilot, and assistant operations officer for three years. Another two years were spent at Andrews Air Force Base in a similar capacity before the Air Force selected him to attend North Carolina State University to study for a master's degree in nuclear engineering. This assignment proved to be a turning point in Jim's career. Thereafter his assignments were to have a high degree of technical orientation. Upon graduation the Rawers moved to Kirtland Air Force Base, New Mexico where Jim served a four-year tour at the Air Force Special Weapons Center as chief of the Nuclear Hazards Branch. Then it was on to the Eastern Test Range at Patrick Air Force Base, Florida as chief of the Missile Analysis Branch. After six years at Patrick, Jim was beckoned back to Washington to attend the Industrial College of the Armed Forces where he earned both his diploma and an MBA from George Washington University. Jim's post-ICAF "career broadening" assignment sent him to Headquarters Air Force Systems Command at Andrews Air Force Base as Director of Information. The years 1970-71 found Jim in Vietnam as commander of Detachment 6, a unique Air Force unit in that combat theater. Its mission was to introduce new technology systems such as laser guided weapons, advanced LORAN navigation bombing, electronic countermeasure systems and the like into the combat units, and to translate combat operational requirements into research and devel- opment initiatives that could be under-taken on a quick reaction basis. Upon his return to the States in 1971 Jim embarked on another career path that was to endure for the rest of his life. In many ways the intelligence field and Jim were made for each other. His technical background and native intellect, his uncommon good judgment and common sense, his penchant for circumspection and abhorrence of flamboyance all combined to make him an ideal selection. Jim was assigned to the Air Force's Foreign Technology Division at Wright-Patterson Air Force Base, Ohio, an organization with preeminent credentials throughout the Free World in the field of technical intelligence. Jim's outstanding performance was soon rewarded by his being named to be vice commander and then commander of the division. It was from this position that Jim retired from active duty in August 1975 after 26 years of commissioned service. His awards and decorations included the Legion of Merit, the Air Force Commendation Medal, the Vietnam Service Medal with three Service Stars, and the Air Force Outstanding Unit Award with "V."
Jim was not finished with his life's work, however. He and Jane moved to Washington where he immediately began work as a member of the Intelligence Community Staff, Central Intelligence Agency. For the next twelve years his superb work in the intelligence field resulted in successive assignments of greater responsibility. In April 1983 Jim was appointed to the Senior Executive Service, the flag officer equivalent in the federal service. The following year he was named the Department of Energy's Director of Scientific and Technological Intelligence, a position that he held until he succumbed to cancer on 15 March 1987, just a month short of his 60th birthday. In addition to his wife Jane he is survived by their four children-Linda, Robert, Scott, and Barbara; a brother, Robert K.; and a sister, Betty J. Rawers. Jim Rawers had a lifetime of noteworthy and newsworthy achievements, but to those of us who knew him and loved him, he will remain in our memories most for the very special person that he was-a loving father and husband who cared- deeply about his family and the world around them; a soft-spoken, easy-going, and private person for whom the nickname "Gentleman Jim" was a perfect fit; a man whose personal achievements were no more important to him than yesterday's news; a truly educated professional officer and public servant who had that rare capacity to see problems and and situations in their larger contexts and ramifications. Even as he fought the only losing battle of his life, his true character never wavered. As his affliction became more serious, he still maintained a cheerful and optimistic attitude and never complained or indicated the pain that he was enduring. That was the way he was. Jim Rawers was a big man.